The first thing an employer will read about you is your cover letter. It needs to stand out and make an impact. It needs to be targeted, specific and to the point. You get one shot at making an impression and a cover letter is a perfect way to do it. Check out our cover letter templates below. These samples will get you started writing the perfect cover letter for your next application. Lots of jobs don’t ask for a cover letter but this is a perfect way for you to promote your core competencies before an interview. There are times when you are required to send a cover letter in email format. There are a few differences in the formatting but the principles are the same. 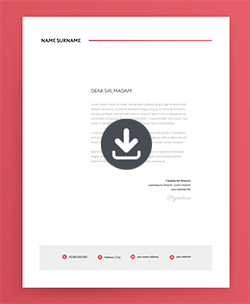 Above is a handy email cover letter template you can download for review. The content of your cover letter should be the same but there is no need for contact information at the top of the email. You can provide your information as part of your signature. Try to find out the name of the hiring manager or contact within the company. If this is not readily available the call the HR department and ask for the best person to send it to. A simple thing like addressing the person at the start of the email makes a big difference. Use your name and the open position as the subject line of the email. For example, ‘Mary Bloggs, Office Assistant.’ This gets your email to stand out in a busy inbox. Use a professional email address to send all applications. That email address you had when you were in college may have been cool but may not be professional enough for job applications. Set up a dedicated email address on Gmail for this. You should always be professional when opening and closing an email application. For the opening use: Dear (Hiring Manager) – remember to try and find out their name first. For the closing use: Sincerely or Kind Regards. The email should only be a few short paragraphs. You are trying to quickly display your suitability for the advertised position so use solid examples of why you are the best candidate. Bullet points are a great way to highlight core competencies and short paragraphs work best. No more than 2-3 lines per paragraph makes it easy to ready.